By Kay Tan in Internet. Updated on November 14, 2017 . Google Reader is shutting down in July 2013 and we guess most of you have already migrated from Google Reader to Feedly. Feedly is one of the best replacement for Google Reader since it provides powerful feed navigation features and it is available on multiple platforms (iOS, Android, Kindle, Chrome, Firefox and Safari). If you want to get the most out of Feedly, this post is for you. Here, we have compiled keyboard shortcuts, tips and tricks to optimize the browsing and reading experience. 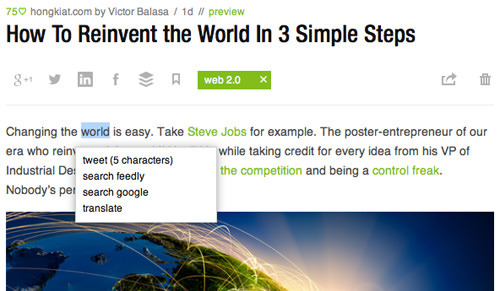 Here’s where we share with you some of the useful tricks to help you with Feedly. If you have more to add, just drop it in the comments section. #1. Expand the browser width to display the navigation menu on the left and search feature on the right. #2. 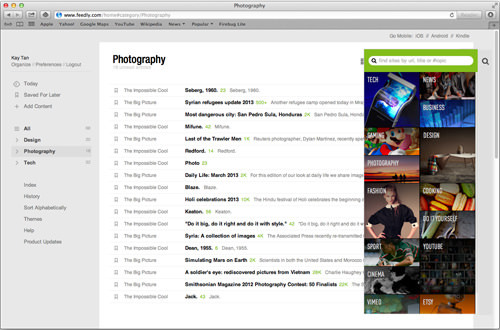 Choose your favorite view options on the top right – Title Only View, Magazine View, Cards View or Full Article. #3. You can easily “mark all as read” by pressing Shift + M or just click the number next to the website title. #4. Go to the “organize sources” page or press G D to define and re-order subscriptions and categories. #5. 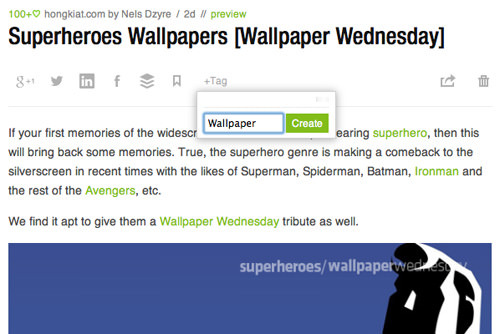 You can insert a tag to articles so you can easily organize your feed via the tag button on the left. #6. Install Readly userscript to make the layout a little more compact and to display more content on the full width of the screen. #7. Just drag this bookmarklet – Add to Feedly and drop it to your browser bookmarks /favorites bar for subscribing to RSS feeds. #8. Go to Preferences > Auto-Mark As Read On Scroll to activate "All Views". 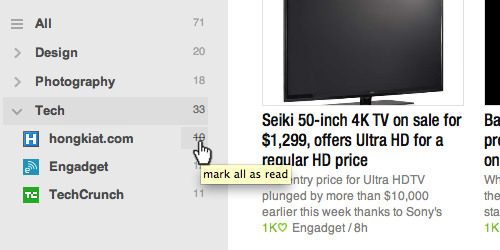 Feedly will automatically mark articles as read when you scroll through them. #9. Get the options of tweet, search Feedly, search google and translate by double-clicking or highlighting any word(s) when previewing an article in Feedly. #10. 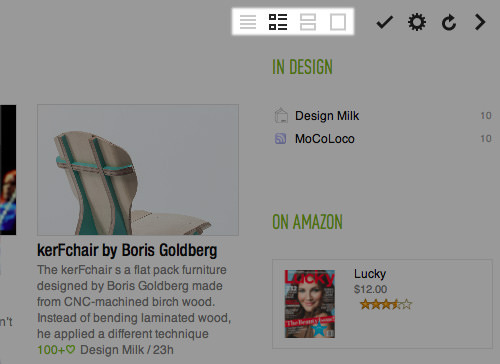 In Preferences > Favorite Sharing Tools, you can also add your favorite sharing tools and see them displayed in the Feedly mini toolbar.